Richard Atkinson says his 10000Hours group's £1.25m bid for St Mirren remains on the table, despite it being rejected by the controlling consortium. But he stresses that the fans' co-operative will not increase its offer. "We made an offer that we viewed that was both sustainable and deliverable by the fans," he told BBC Scotland. "But we did not want to make an offer that we couldn't afford. Chasing the ownership is something that's got to avoidable at all costs." The controlling consortium, which includes chairman Stewart Gilmour, said it rejected the bid because of "numerous changes" to the offer and because they sensed doubts within 10000Hours itself about its own bid. But Atkinson believes that the group continues to believe that a Community Interest Company is the best way forward for the Scottish Premier League club. "We have withdrawn from the process with our members - their direct debits have been cancelled - but we have left the offer of £1.25m on the table because, until the club is sold, you never know what might happen," said the Irvine-based businessman. "No matter the knocks, we have always come to the same conclusion - that fan ownership is something we fundementally believe in. "It is gutting and disappointing, but it has been a privilage to be involved." The group had won the backing of more than 1000 fans and community members who committed to paying a basic entry price of £10 per month to bid for the 52% stake in the club that is currently up for sale. Despite the failure of his bid, Atkinson does not have any fears about the future of the Paisley club, or that it might be sold to unsuitable parties. "The key thing with the football club is that the selling consortium have brought the club to a position of complete sustainability," he said. "It can remain as it is and it wouldn't be a problem to anybody, or it can be sold to someone. "I think it is fair to say that the consortium's primary concern is that it is owned by a group of people they want to own it. "If our bid is not of the scale they want, or they have other issues with it, that's entirely up to them." Atkinson added that he thought manager Danny Lennon was taking the club in the right direction on the field of play. 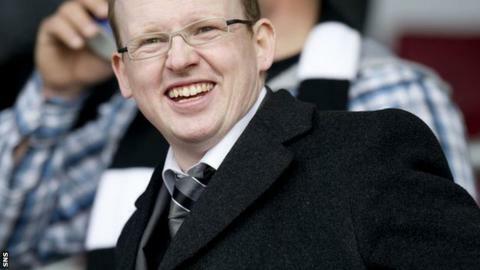 "The future of St Mirren is incredibly bright," he added. "So I don't think anybody should be worried that anything happening behind the scene will impact on the good work Danny is doing on the pitch."